Personally 2016 has been a highly anticipated bookish year for me because with Brandon Sanderson’s „Reckoners“ series, Rick Yancey’s „The 5th Wave“ books and Pierce Brown’s „Red Rising“ saga three of my favorite science fiction science fiction trilogies came to an end within just a few weeks. 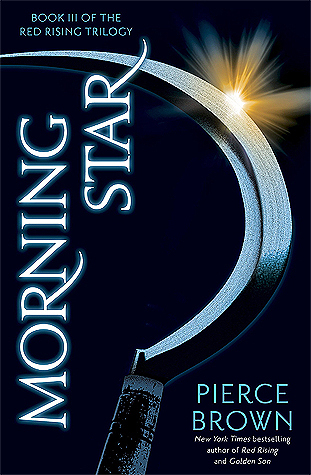 While „Calamity“ seemed way too rushed in the end and „The Last Star“ also felt quite underwhelming to me, all my hopes were then set on „Morning Star“ and I’m not sure if I would have survived three disappointing trilogy endings in a row – thankfully Pierce Brown didn’t disappoint. Does the resistance still have a chance to succeed? 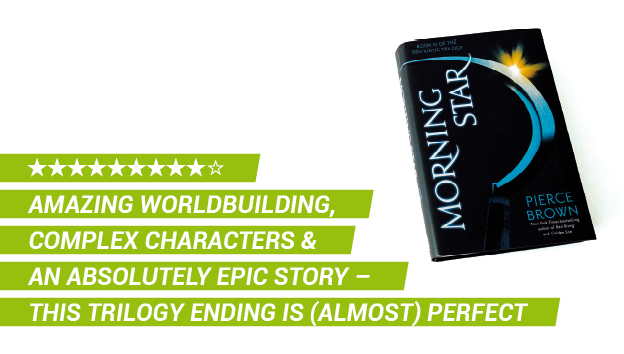 Pierce Brown’s „Red Rising“ trilogy has always been a masterpiece when it comes to worldbuilding but „Morning Star“ still manages to take it to an even higher level. It’s not only the extremely complex structure of the society in Darrow’s world with all the different classes and colors that make this space setting so special, what I absolutely loved about these books is that while other dystopian series tell you that society or the whole world are falling apart, this trilogy actually makes you FEEL it on every single page. I’ve never read a science fiction or fantasy novel that made war feel so real and terrifying and hopeless and the way Pierce Brown describes all the fights and battles creates a very intense atmosphere that just won’t leave you cold. I can’t say of myself that I’m in general a big fan of massive battle scenes because I tend to get tired when I’m faced with too much nonstop action in books or movies but Brown’s interplanetary war was just epic and I loved how it made you realize every single minute how high the stakes were and what consequences Darrow’s actions would have on the whole world. War isn’t just a game in these books and you could never be sure if your favorite characters were going to make it or also if they would stay loyal to Darrow’s mission and this unpredictability was one of my favorite aspects of the whole trilogy. Brown’s books were never a light read and it always took a lot of attention not to get lost between all the different characters, their heritages, the different social classes and the relationships but this complexity was another thing that made this trilogy feel so realistic even though it’s set in a future several hundred years away from now. I would definitely recommend binging the series now that all three books are out because taking a break from them can be fatal when it comes to following and understanding the plot since the story is so complex that it’s hard to find back into it after a longer absence, especially because the relationships between the characters are changing all the time and people are turning their backs on each other and betray even their closest friends – just to make a pact with them again several chapters later. I can understand everyone who finds these books confusing and maybe too challenging but in my opinion it’s definitely worth being patient and digging into this complex and extremely fascinating world. Pierce Brown has done a fantastic job wrapping this epic story up and „Morning Star“ has given me everything that I had wished for: hope, betrayal, grief, fear, love, terror, amazing worldbuilding, complex and interesting characters, a gripping story and – most important – an ending that felt very satisfying and like the perfect conclusion to me. If I had to find a point for criticism than maybe it would be that while „Golden Son“ wounded me to the core with its shocking ending I didn’t have a moment like that in „Morning Star“ – this final book definitely had a lot of great plot twists and shocking turn of events but none of them made me feel so much pain as the final pages of the second book and I guess we agree that pain in books is always a good thing? „Morning Star“ has a similar scene though but in this regard I had seen Pierce Brown’s ploy coming already so that it didn’t destroy me as much as the author had probably intended. But besides that Pierce Brown delivered a fantastic ending to his epic saga and „Morning Star“ more than lived up to my expectations. But the best thing is that while the author perfectly wrapped up THIS story there’s still more to come and I can’t wait to go back to this universe and hopefully the characters (well, at least to those who survived…) in Brown’s follow-up „Iron Gold“ series. With the final book "Morning Star" Pierce Brown delivers a fantastic conclusion to his epic science fiction saga that provides everything that already made the first two books so special: an amazing worldbuilding, complex and interesting characters, a gripping story about hope, betrayal, grief, fear, love and terror and an ending that perfectly wraps up Darrow's journey to bring freedom to his people. Great review! I’m proud of you for finally posting it. ;P As you said, thank god Morning Star didn’t disappoint. I’m really glad I gave this series another try after initially disliking Red Rising!